As a fan of The Rolling Stones, I'm a little embarrassed to admit that this is the first one of their "From the Vault" releases that I've purchased, though I believe this is the seventh one they've put out. Part of what's been keeping me away is that there are simply too many choices. Consider this release, which can be bought on a DVD/3-LP set, a Blu-ray/CD combo, a DVD/CD combo, and a standalone Blu-ray. Too many options means I can't decide which one of those I want the most. They all have their pros and cons. In the end, I chose the Blu-ray/CD combo, so that's the source for this review. I'll mostly be talking about the Blu-ray of the concert itself, because the music on the CD is the same. Sticky Fingers is widely regarded as one of the band's absolute best, coming three-quarters of the way through their absolute artistic and creative power. There are four albums that prove the Rolling Stones to be the greatest rock and roll band ever: Beggar's Banquet, Let it Bleed, Sticky Fingers, and Exile on Main Street. Arguably, Sticky Fingers represents the band right before the burden of reinvention, drug abuse, and mega-success took too great a toll and found them adrift for the latter part of the seventies. This show, which kicked off the U.S. leg of their 2015 Zip Code tour, took place at The Fonda Theater, a legendary venue located on Hollywood Boulevard in Los Angeles. It was the first time that the band had ever played a complete album (albeit out of sequential album order). One of the consequences of living in our society is that we can't discuss any recent concert or tour by the Rolling Stones without at least addressing their age, so I'm going to do that up front so we can move on. Yes, it's amazing that these guys are in their seventies and are still basically doing the same thing they've been doing for over fifty years. However, any jokes about "grandpa shaking it" or "singing from a rocking chair" would be completely misplaced. The fact of the matter is, yes, they're old, but they are still unbelievable on stage. Mick Jagger has lost absolutely nothing. He struts and preens like he did in 1971, clearly in better shape than probably anyone reading this. Considering the amount of substances Keith Richards has used and abused, it's amazing that he's still alive, and yet here he is, strumming out some of the most iconic guitar licks in music history. Charlie Watts still pounds the skins with the same unique timing that has made this band stand out against their peers who have come and gone. Time and time again, The Stones have proven to themselves and to everyone that age has nothing to do with rebellion, doing things your own way, and living outside of what's expected. As the reigning oldest living rock and roll band in history (think about it: everyone else either broke up long ago or faded away), they continue to set the standard for how rock and roll bands SHOULD act in their twilight. Like Bob Dylan, these guys just might die on stage. Probably won't be any time soon, though, because the music keeps them young. This show is, simply put, incredible. The smaller size of the theater ("I mean theatre") means that this is a relatively intimate show for a band that regularly sells out arenas, but they still burn it to the ground and take no prisoners. Mick saunters back and forth, whipping the crowd into a frenzy and making little jokes with the audience. Keith, on the other hand, seems content to stay in the back unless he's needed on backing vocals. He has a sly grin on his face for most of the show, like he's in on some sort of secret that nobody else knows. I suspect he's amused by the power of the music itself and the novelty that a fair portion of these songs that have either never been performed live or haven't been touched in decades. The bottom line is that this is a pretty rare event for the band, and it feels like it. The set list, as I mentioned earlier, contains the entirety of Sticky Fingers, though, as Jagger jokes, not in album order but in the order from the 8-track. There are also a few additional surprises in the set list, like "All Down the Line" and "When the Whip Comes Down." And of course, it wouldn't be a Stones show without "Jumpin' Jack Flash" or "Start Me Up." For some reason, the Blu-ray omits some of the songs that aren't from Sticky Fingers from the main film, but includes them as special features. I suspect the film itself was put together for some cable channel which made a concise running time necessary, but I don't know for sure. There's been some...let's say distaste among some fans because Mick Taylor, the guitarist who played on the original album and was a member of the band for five years (from 1969-1974), is not present at this concert. Instead, Ronnie Wood steps in and handles those guitar parts, as he has done for decades now. I get that this is kind of a big deal because Taylor is still alive and it was, after all, he who played on those songs. But then again, he hadn't been an active member of the band in 41 years when this show took place. Ronnie Wood had been playing those parts forever, and I have to imagine that comfort and trust play a huge part in something like this. The fact is, Wood is the chosen guy, a fact that doesn't seem to be lost on him. He and Keith have been intermingling their guitar lines for four decades, doing what Keith calls "the ancient art of weaving." I suppose it would have been nice to have Mick Taylor play at this show, but I completely understand why he didn't. Of course, this is all speculation on my part. Maybe they asked him and he simply said no. I'd be surprised, though. Concert films can be difficult to present in video form. It doesn't seem like it should be that hard, but there are a ton of unsatisfying ones out there that spend way to much time on the audience (a crime this one is guilty of from time to time) or they hyper-cut the images so quickly that you feel like you're about to have a seizure. Thankfully, this package avoids the quick editing pitfall and doesn't call too much attention to itself. We should be watching the show, not the editing. Something else the film does is place interviews with the band members in between some of the songs themselves. I normally can't stand this, but seeing as how all the interview footage is pertinent to the songs they precede, I can let it slide. For instance, before we see/hear "Brown Sugar," we get footage from the band members talking about that song and why it feels special. Sometimes I'm guilty of taking The Rolling Stones for granted. The band themselves have contributed to this from time to time, and any career that's lasted as long as theirs is bound to have monumental highs and deep lows. However, there's simply no denying the power of the music from this period in their long, illustrious career. This isn't hyperbole (though I suppose it is opinion): many of the songs from this concert are among the finest in rock and roll. There is simply no topping "Wild Horses," "Dead Flowers," or "Can't You Hear Me Knocking." 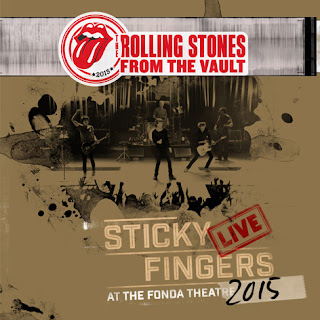 This 2015 concert is a nice reminder that The Rolling Stones were founding fathers in the British rhythm and blues movement that ultimately became what we now know as rock music, and that they are simply the best at what they do. This isn't a band that once had some glory days, hashing out their greatest hits because that's what old bands do now. No, this is a band that has lost nothing to time, reminding everyone how it's supposed to be done. When the music kicks in, the years fade away and there's nothing else like it on the face of the earth. You can pick up Sticky Fingers Live at The Fonda Theatre here.